Southampton: Gazzaniga, Clyne, Fonte, Alderweireld, Bertrand, Steven Davis, Wanyama, Long, Ward-Prowse, Mane, Pelle. Aston Villa: Given, Bacuna, Okore, Vlaar, Hutton, Cleverley, Westwood, Delph, N'Zogbia, Benteke, Grealish. Nabil Hassan's match report from St Mary's. Aston Villa manager Tim Sherwood: "It was unrecognisable from the team we had but credit to Southampton for punishing us for our mistakes, and there were a few. "The defenders don't need to be told, the whole team are in it. I take responsibility for that. That is one bad 45 minutes since I have been at the club. As much as we feel sorry for the fans, it was not a bad turnaround. "We have to win a game and then a Cup final, there is no point in me stripping paint off them. Any idiot knows we didn't play well, they don't need telling. "If we beat Burnley next week, it is in our own hands and we will be safe. The Cup final is not even in our minds at the moment, because we are not safe yet." Still waiting to hear from Aston Villa manager Tim Sherwood. He may have locked his team inside the dressing room to give them a stern talking to. The Southampton players are back on the pitch with wives, girlfriends and children. They perform a lap of honour in front of the crowd, as they are playing at home for the last time this season. Southampton manager Ronald Koeman: "I didn't expect that first half. We played fantastic football and had good movement and players running in to space. It was strange to see the opponents playing one line and we punished them for the space they gave. "The goals were great and it is hard to keep concentration in the second half but the victory was well-deserved. "It was incredible from Sadio Mane. A player like him, to get that kind of space, he will punish you. The whole team did a good job and I am proud. Hat-trick scorer Sadio Mane: "Really? It is the fastest Premier League hat-trick? The most important thing today is the victory. "We have a chance to finish in the Europa League spots. We will try to win the next game against Manchester City and why not win it? "We have a great team and last week was not easy but we have to work hard every game." Match of the Day commentator Simon Brotherton describes Aston Villa's performance as "wretched". Never has an adjective been so apt. They will be up there in the running order on BBC One tonight. It will be interesting to hear Tim Sherwood's thoughts after this defeat. He is going to be seething. Sadio Mane waves to the crowd and takes home the match ball. Well deserved. "It's nothing to do with Tim Sherwood what's happened today. He's set his team out and been very professional, but the players just haven't put in the performance. "It's an awkward situation with the FA Cup final around the corner and their survival on the line still. Everyone of them in that dressing room will be looking on nervously at the result at Hull." That's it. Southampton run out comprehensive winners. Gabriel Agbonlahor spins at the edge of the area, makes his way into the box and drives a low shot towards goals, which is stopped well by Paulo Gazzaniga. He was had a brilliant game. ..but Fabian Delph's ball into the box is awful. He was given a new contract earlier this season, they should cancel it after that delivery. It was terrible. Kelvin: Somebody find #shaygiven cuz it's open goal at St Mary Stadium. "Alan Hutton on the right-hand side played a good one-two and an intelligent cross, but Gabriel Agbonlahor was very unlucky there, he found the keeper who made a great block." Surely a second for Aston Villa? Alan Hutton works an opening to find Gabriel Agbonlahor, who hits it low and firmly towards goals, but it is kept out well by Paulo Gazzaniga. Should have scored. Three more minutes to play, three more minutes for Aston Villa to suffer..
Not yet, as the try to work the ball into the back of the net, but surrender possession. The 'oles' are out from the home supporters. Eljero Elia earns a corner, as his pace gives Alan Hutton a headache. Can they get another? "Southampton's structure and what they do as a club really does sum up football. It's made to look hard by some and easy by others. The one word that sums it all up is recruitment. They've picked up players cleverly through a worldwide scouting network and they've also produced their own." Tricks coming out from Sadio Mane now, lollipopping over the ball. Aston Villa have not got near him today. No Pelle, no party. Graziano has had a wonderful game, capped by a superb goal. He comes off to be replaced by Dutchman Eljero Elia, who has five minutes to get on the scoresheet. Fifth-placed Liverpool will be looking over their shoulder, as Southampton are just two points behind now. "One of my favourite goals of the season. Sadio Mane plays the best one-two I've seen all season. That's simplistic genius. Beautiful goal and Villa getting absolutely hammered." Sorry, I said the game was petering out..
Not a bit of it. Beautiful play from Saido Mane, who plays a one-two before whipping the ball into the box and Graziano Pelle volleys in a first-time finish. Lovely stuff. Sumptuous. Into the last 10 minutes, this game is petering out now. A party atmosphere in the St Mary's stands, with a fancy-dress conga jumping around. Another change for Aston Villa. James Ward-Prowse has done excellently today and deserves a pat on the back, as he is replaced by on-loan Filip Djuricic. This Southampton side really do work very hard, helping out each other. Aston Villa had a glimmer of another goal, but the home side defend in numbers to keep it out. "Isn't it wonderful to see someone brimming with confidence? Sadio Mane has been full of running all afternoon and he must feel on top of the world after that hat-trick." Oh Nathaniel! Full-back Clyne blazes into the stand after finding the ball at his feet inside the area. A glorious chance missed by the England man. Will he still be at the club next season? Nearly a dream substitution from Southampton, as Maya Yoshida's powerful header is saved on the line by Shay Given. Where was the marking? Southampton full-back Nathaniel Clyne makes a run into the opposing penalty area and forages a chance for Graziano Pelle, and it is blocked for a corner. "Even now at 5-1 up, Shane Long and Sadio Mane, the left and right sides of Southampton's attack are still tracking back and working hard for their team-mates every time they lose the ball." Southampton make their first change. Former Aston Villa man Steven Davis gets a warm round of applause as he comes off to be replaced by Japanese defender Maya Yoshida. A quick reshuffle in the side. Bit quiet now. Southampton happy with their lead, while Aston Villa attempt to reduce the deficit. Booking for Southampton's Victor Wanyama, for bringing down Fabian Delph in the middle of the park. His 12th yellow of the season. Puts himself about a bit. Another substitution for Aston Villa. Leandro Bacuna comes off and Matthew Lowton comes on. A full-back. Time to change the game, son. Good luck. A chance for Aston Villa on the left. The free-kick is floated in by Jack Grealish - who has been quiet today - but is punched away by Southampton stopper Paulo Gazzaniga. Impressive keeping. "Every player that Southampton have lost, they've bought in someone slightly better this season so Ronald Koeman deserves a tremendous amount of credit for what's he's done since taking charge." It is unsure where defender Toby Alderweireld - on-loan from Atletico Madrid - will be playing next season, but Ronald Koeman will be doing his utmost to keep him at the club next season, a very impressive performer for the Saints. "Toby Alderweireld runs in on that header and he just looks like he's got more purpose about what he's doing. You've got to want to make things happen and that's been the difference today." Nearly the third for Shane Long. Fellow strike partner Graziano Pelle works hard to win the ball back before launching it high into area, but Long can't get enough on the volley and it runs wide of goal. Still plenty of time to complete his treble. Ooh, beauty of a ball into the box from the impressive James Ward-Prowse. It's flicked on by Toby Alderweireld but pushed away by Shay Given. The ball was creeping in, you know. Turns out to be a good stop. "Southampton are in well-regimented lines every time they lose the ball and have to defend. It's only Graziano Pelle who is in Villa's half. It's like a bow and arrow. Every time you fire an arrow, you have to reload as quickly as possible otherwise you're going to be in trouble." Alan Hutton tries to curl one into the top corner from the edge of the box..
..but gets it horribly wrong, finding row Z. Not good! Sadio Mane has taken your fastest Premier League record, Robbie. Charles N'Zogbia is hooked and is replaced by Gabriel Agbonlahor. Manager Tim Sherwood is allowed only three changes, but he if could make 11, he would! Ronald Koeman sits on the Southampton bench next to his brother Erwin. The duo have done a marvellous job at St Mary's this season. Most successful footballing siblings since Gary and Phil Neville? Even at the back, Southampton are fighting, trying to give nothing away. They are not taking this lightly, even though they have a four goal advantage. Jose Fonte crunches into a tackle which is warmly applauded by the fans. "This is bizarre, some of the things I've seen today. I've never seen the likes of Ron Vlaar perform like they have today. There's rumours of bigger clubs coming in for him, but not on today's performance." Southampton are sniffing and it won't be surprising if they get more goals here. Remember, Shane Long is on a hat-trick..
Peerpresha: Dropped my pen at 0-0, picked it up 1-0, sat up 2-0, rubbed my eyes 3-0, widened eyes 4-0, dropped jaw 5-0, left the room 5-1. A hairy moment for Shay Given, as he decides to come for a cross for the first time in his career, which he makes a hash of, nearly gifting another goal. Should have stayed at home. Brilliantly whipped in corner by youngster James Ward-Prowse, which is flicked away for another, but it comes to nothing. Corner for Southampton, and there is some wrestling going on in the box, with illegal tactics being used to stop Sadio Mane. Well, they have to do something. Free-kick in an inviting position for Aston Villa and is it swung in by Charles N'Zogbia..
..but a poor, poor delivery. They won't get back into the game with crosses like that. Oh, Aston Villa have come back. They kick off in the second half. How many more goals will we see? Southampton fan Craig David (yes, THE Craig David) has tweeted: My mum got this birthday gift right! The big question is, will Aston Villa return for the second half? Can they just tell the referee, 'We don't want to play any more' and go home? Dan, London: Good work Southampton. Good to put this "Sherwood is a genius" utter nonsense to bed. "I've literally in my life never seen anything quite as bizarre as the hat-trick and there was a goal disallowed before that. As a manager, I absolutely feel for Tim Sherwood. "All his preparation would've gone in minutes. Jack Grealish, who has had all the plaudits recently, has had an absolute shocker where he has played a ball blindly to someone in a Southampton shirt and that's led to a goal. It just shows the inexperience." What is this doing to Aston Villa's confidence? They don't want to go into the FA Cup final against Arsenal playing like this, it will be an embarrassment for Tim Sherwood and his side. They have one more game in the Premier League after this against Burnley to get it right. 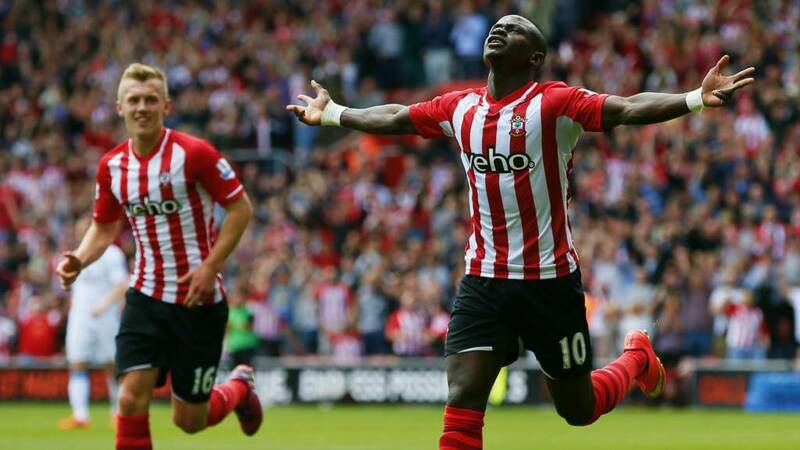 Blackburn Lad: Sadio Mane writes himself into Premier League history. Well done that man. Ben Dalton: Villa getting hammered should be motivation for #NUFC to really show up today & blow away a poor #QPR side. But it won't be. Southampton's Sadio Mane - with the newly held title of fastest Premier League hat-trick scorer - has been everywhere, as this touchmap shows. He has even found time to help out his defensive colleagues. Have you ever seen anything like that? St Mary's is shellshocked, as is the rest of the country. So this is why they say the Premier League is the most entertaining league in the world? "What a game! Everything that's near the net today is going in. Brilliant header and boy did they need that, Villa, but is it too late?" What a half of football, incredible stuff. The comeback is on!! Surely not, surely they can't do it, can they? Leandro Bacuna whips a beauty of a ball into the box, and striker Christian Benteke leaps highest to plant a header into the net. Great power in that. Shane Long through on goal, but Fabian Delph is helping out at the back to clear the ball for a corner, which comes to nothing. Three added minutes for Aston Villa to suffer. "Football today is numbers. You have to get defensive numbers back. You cannot leave three up front away from home and that simple fact has been totally overlooked by Aston Villa at the moment and Tim Sherwood is going to be absolutely furious at half-time." Southampton are not backing off here, they want more goals. Graziano Pelle has a shot blocked inside the box. Can they double their score in the second half? "Unbelievable. Shane Long looked disinterested and then he just picked the player's pocket before bending in the most spectacular, fantastic shot in to the top corner." Alan Huttonnnnn! Nope, a pot-shot from way out dribbles into the arms of Paulo Gazzaniga. Ironic cheers from the Southampton fans. The good news for Aston Villa is that there is only four minutes play to half time. What on earth is going? "It's flown in like a missile," former Southampton manager Dave Merrington tells BBC Radio Solent, and he is not wrong. What a brilliant strike from Long and what a brilliant performance this is from Southampton. Aston Villa boss Tim Sherwood has his head in his hands, more fans walk out of the stadium. This is absolute stunning from Shane Long. Aston Villa give the ball away again, but what a finish. He picks the ball up around 30 yards out from goal...and lets fly! The ball sets off and everyone watches with mouths open, as it plonks into the top corner of the net. Nothing Shay Given can do about that. Just a simply, superb strike. "If you could give the old NFL-style time out signal right now. Tim Sherwood would be out there. I had one of these days earlier in the season with Millwall where we fell 2-0 down against Norwich early on and it can be horrible to try and stop." What are Southampton playing at? They need to get their act together. They've not scored for over 10 minutes now. Confidence seeping through the Southampton side as Paulo Gazzaniga rushes to the edge of his area to collect a high ball with ease, he gave a big shout as he came out there, superb goalkeeping taking the pressure off his defenders. Charlie Smith: Tim Sherwood does not do defence. It can be a great strength but when exposed it can also be the most heinous of weaknesses. Shane Long and Graziano Pelle are causing the Aston Villa backline problem after problem, they just cannot cope with Pelle's power and Long's pace. Tim Sherwood is back in his chair with a resigned look on his face. Like his club's supporters, he will want to leave St Mary's as quickly as possible after this showing. "The discipline in Southampton's lines has been immense, but it's been like that all season. They've kept their shape tremendously well. This could be a cricket score the way things are going with Southampton's confidence. Tim Sherwood has got to get his full-backs to tuck in more." Aston Villa manager Tim Sherwood is out of his seat, patrolling the touchline but there's nothing he can do at the moment. Southampton go forward again, but Graziano Pelle's shot is blocked well by Jores Okore. Simon Holman: Mane Mane Mane must be funny, in Southampton's world. "This is unbelievable. There's an apathy about Villa, they are not doing their jobs. The midfielders are tracking to their men, they have got to try to regain their composure. This is a disaster for Villa at the moment, this could be shattering for them. They only need one more win. But in the Premier League that's huge and then there's the FA Cup Final for them to think about." Aston Villa need to salvage some pride in this match because this has been a shocker of a performance so far. What can Tim Sherwood's side do now? "A little lad asked me for a photograph before the game, and I asked him who his favourite player was, and he said 'Mane'. I can see why now." Unbelievable! Aston Villa fans already walking out of the stadium, but who can blame them?! They have been destroyed so far. A complete shambles at the back. And there is number four. Another easy one for Southampton, who have had their stroke of fortune today. Graziano Pelle's effort is saved by Shay Given, but the ball falls into the path of Shane Long, who passes it into the back of the net. A rout already! Southampton continue to pile forward and they could easily get six or seven here today. The crowd at St Mary's are almost silent, they are stunned, they can't believe what they are seeing from their side. "Absolute bedlam here at St Mary's and an absolute privilege to witness Sadio Mane's two minute 56 second hat trick. Aston Villa are in disarray here, they are a shambles. I just can't believe it," former Southampton manager Dave Merrington tells BBC Radio Solent." Fastest Premier League hat-trick ever from Sadio Mane, timed at two minutes and 56 seconds. "Mane's pace was electric. I am astounded at his pace and strength. I am shellshocked by Villa, this is unbelievable, I have to pinch myself! What is going on? Villa have been in pretty good form of late." Holes everywhere in the Aston Villa defence, the confidence has gone completely. Chance for James Ward-Prowse as he ghosts forward unchallenged but his short is straight at Shay Given. GOALLLLLLL!!!!!!! INCREDIBLE SCENES! And it's Sadio Mane AGAIN! Robbie Fowler's hat-trick all those years ago against Arsenal was quick, this one is quicker and the third is a beauty. He is picked out at the edge of the box, and slots in a superb first-time effort into the top corner of the net. This is crazy, this is madness. Absolute carnage at St Mary's. Wow! Shocking defending from Aston Villa, architects of their own downfall. It's that man Sadio Mane again, nipping in after Ron Vlaar's backpass falls short of Shay Given, and Mane pops the ball into an open net. 84 seconds between the two goals. A big punt up field and Graziano Pelle flicks the ball on. Winger Sadio Mane is quickest on to it and needs some luck, as the ball ricochets back off Shay Given, giving him an open goal. He can't miss! You have to do better Christian Benteke. The Belgian is played in with only Paulo Gazzaniga to beat, but his outside-of-the-foot finish goes wide. Had to put his left peg through it! Left-back Ryan Bertrand plays through striker Graziano Pelle on the left-edge, the Italian makes his way into the box but the finish this time is weak, as goalkeeper Shay Given is able to push the ball away easily. Poor finish. Aston Villa are showing intent by moving the ball quickly upfield, but the home side are coping well with the threat of Christian Benteke and Tom Cleverley. Manager Ronald Koeman will be tweeting about that later..
Southampton have the ball in the back of the net!! Striker Graziano Pelle goes through and strokes in a neat finish, but the assistant has his flag up for offiside. Terrible decision, the Italian is clearly on but the liner gets him confused with the man running out. Home fans aggrieved. "One of many intriguing battles today sees two Belgian compatriots come up against each other. When Southampton defender Toby Alderweireld was asked about facing Aston Villa forward Christian Benteke today he told BBC Sport: "It's going to be a tough game for both of us." One to keep an eye on." A bit of a shaky start from Southampton at the back as Toby Alderweireld gives the ball away, but his fellow team-mates at the back come to his rescue and are able to get the ball away. Pats on the back, check. Off we go! Southampton get us under way at a sun-soaked St Mary's Stadium. Substitutes: Kelvin Davis, Yoshida, Gardos, Djuricic, Elia, Reed, Targett. Substitutes: Guzan, Sinclair, Weimann, Agbonlahor, Senderos, Sanchez, Lowton. Click the Live Coverage tab at the top of the page where former Blackpool and Crystal Palace manager Ian Holloway will be summarising in the commentary box. "It is a glorious day on the south coast for today's early kick off with both teams having very different agendas at St Mary's. "Southampton manager Ronald Koeman has used his programme notes to urge players and punters alike for one final push in the race for European football. "Aston Villa are in decent form and Tim Sherwood's men were out very early warming up and going through various drills. They look focused and ready for their attempt to beat relegation." So, how will these two sides get on today? Who do they need to bring in next season? Two changes for Southampton today with midfielder James Ward-Prowse and striker Shane Long replacing midfield pairing Harrison Reed and Eljero Elia from the 2-0 defeat against Leicester City last Saturday. Aston Villa make one change from the 1-0 win against West Ham last weekend as defender Alan Hutton replaces Kieran Richardson. Welcome to live text commentary of Southampton and Aston Villa. Both of these sides have (almost) defied the odds and completed the task of staying in the Premier League this season. Southampton were predicted to go back into the Championship after losing the likes of Luke Shaw, Adam Lallana, Dejan Lovren and Rickie Lambert, but are now on the verge of a well-deserved European place. Aston Villa - four points above the trapdoor with two games to play - have had their fortunes transformed since the arrival of charismatic manager Tim Sherwood. Did I say two games? They've got an FA Cup final to look forward to as well! They said Southampton would get relegated come May.. They said the same about Aston Villa..